The purpose of this book is to introduce and explain research at the boundary between two fields that view problem solving from different perspectives. Researchers in operations research and artificial intelligence have traditionally remained separate in their activities. Recently, there has been an explosion of work at the border of the two fields, as members of both communities seek to leverage their activities and resolve problems that remain intractable to pure operations research or artificial intelligence techniques. This book presents representative results from this current flurry of activity and provides insights into promising directions for continued exploration. 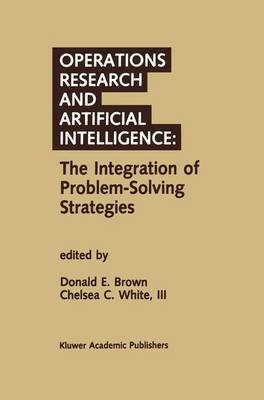 This book should be of special interest to researchers in artificial intelligence and operations research because it exposes a number of applications and techniques, which have benefited from the integration of problem solving strategies. Even researchers working on different applications or with different techniques can benefit from the descriptions contained here, because they provide insight into effective methods for combining approaches from the two fields. Additionally, researchers in both communities will find a wealth of pointers to challenging new problems and potential opportunities that exist at the interface between operations research and artificial intelligence. In addition to the obvious interest the book should have for members of the operations research and artificial intelligence communities, the papers here are also relevant to members of other research communities and development activities that can benefit from improvements to fundamental problem solving approaches.